BUFFALO, N.Y. (AP) — Sabres forward Jason Pominville began the day unable to contain his emotions by choking up when coming to the realization he might be playing his final home game in Buffalo. The 36-year-old ended the day fist-pumping a crowd that provided the fan favorite a standing ovation shortly after he scored to seal a 5-2 win over the Ottawa Senators on Thursday night. Pominville’s goal punctuated the Sabres’ “Fan Appreciation Night” in which Buffalo closed its home schedule by snapping an eight-game skid and winning for just the second time in its past 17 games (2-13-2). Pominville is in his second stint with the Sabres, and uncertain about his future in finishing out the final year of his contract. 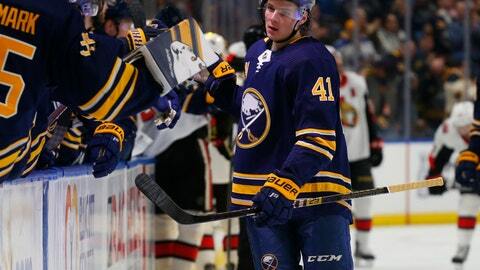 Captain Jack Eichel had a goal and two assists and Kyle Okposo, Sam Reinhart and rookie Victor Olofsson also scored in a game between two non-playoff contenders. Carter Hutton stopped 21 shots and the Sabres overcame a 2-1 first-period deficit. The victory and the rousing cheers reserved for Pominville, who took a turn at center ice during a commercial break, briefly put a dent in the frustrations of a lengthy freefall in which Buffalo extended its playoff drought to eight seasons. The drought that now stands as the NHL’s longest active streak after Carolina defeated New Jersey and clinched its first postseason berth in nine years. Eichel was defiant in blaming the media for being too negative. “I think you guys tend to look at a lot of negatives frequently, myself probably included with some of the interviews we’ve had in the past month or so,” Eichel said. Buffalo finished with 21 home wins, 10 more than last year, and the most since going 21-12-8 in 2011-12. And yet, there remain plenty of negatives for a team that closes its season at Detroit on Saturday. The win was Buffalo’s first in regulation since a 5-2 victory over Washington on Feb. 23. And the Sabres improved to just 15-33-8 since enjoying a franchise-record matching 10-game win streak in November. Anthony Duclair and Jean-Gabriel Pageau scored for the Senators, who were already assured of finishing last in the overall standings. Coming off a 4-1 win at the New York Rangers, Ottawa closed its road schedule with an 11-28-2 record to mark the franchise’s fewest wins since going 10-31 in 1995-96. “We’re not going to make excuses. We’re pros and have to be ready for back to backs,” Senators rookie Brady Tkachuk said. The 22-year-old got the start three days after signing a two-year entry level contract and after he helped Arizona State make its first NCAA Tournament appearance this season. The Sun Devils’ season ended with a 2-1 loss to Quinnipiac in the first round Saturday. Reinhart scored a little over two minutes later. Eichel chased down a loose puck at the end boards and made a no-look backhand pass in front to Reinhart, whose one-timer beat Daccord on the glove side. NOTES: The goal was also Pominville’s 217th with the Sabres, moving him into 10th place on the franchise list — one ahead of Don Luce. … Daccord is from North Andover, Massachusetts, and spent most of his youth playing on teams with Eichel, who is from North Chelmsford. … Senators RW Bobby Ryan did not play a night after being struck by a shot at New York. Sabres: Close season at Red Wings on Saturday.